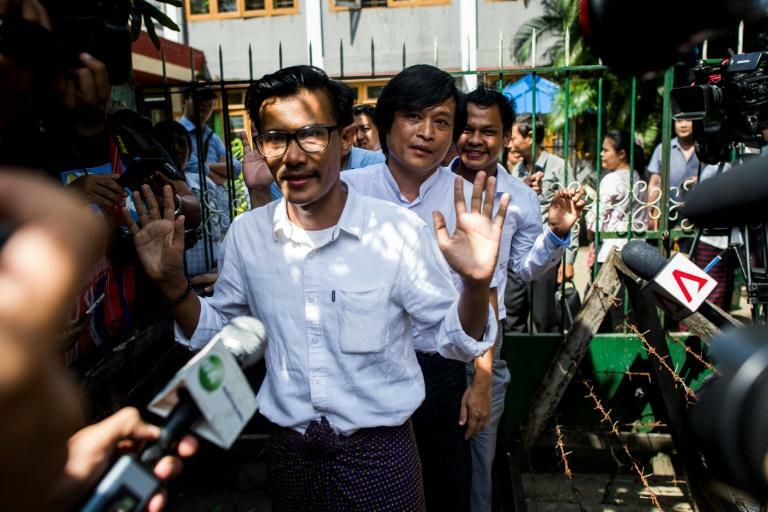 The incitement case against three Myanmar journalists who reported critically on the financial management of Yangon's government has been withdrawn, their lawyer told AFP Friday, in rare good news for the country's beleaguered press. Eleven Media's executive editors Kyaw Zaw Lin and Nayi Min and chief reporter Phyo Wai Win were arrested in October but allowed out on bail after a few weeks in detention. Article 505 (b) criminalises published or circulated information that causes "fear or alarm to the public". The case prompted an outcry amid fears of declining press freedom in Suu Kyi's Myanmar and was lodged weeks after Reuters reporters Wa Lone and Kyaw Soe Oo were sentenced to seven years on state secrets charges while reporting on a massacre of Rohingya Muslims. But the lawyer for Eleven Media's staff said the Yangon government had sent a letter to the court asking to drop the charges and take up their grievance through arbitration at Myanmar's Press Council. "The judge allowed them to withdraw and gave a verdict (Friday) right away. So the case is finished," lawyer Kyee Myint told AFP. "If they do not follow and if negotiation by the press council is not a success, we will continue this case legally," he said.